Three species of silverfish are common invaders of homes and other human structures, particularly where there is excess moisture. However, you may run across a creature that resembles the silverfish in one way or another. A few other arthropods share characteristics with silverfish, but each is very different. The silverfish that invade homes range from 1/2- to 3/4-inch long. As their name implies, most have a silvery or grayish body color. Their long antennae curve back around the sides of their body and they have three bristlelike appendages protruding from the last segment of their abdomen. They prefer areas with high humidity and relatively warm temperatures -- slightly above room temperature. They are nocturnal by nature and will often run quickly when exposed to the light. Firebrats and other bristletails look so much like their silverfish cousins that the term silverfish often accompanies the entire order Thysanura to which they all belong. Members of Thysanura have carrot-shaped bodies that are wider at the head and taper to a near point at the rear, long antennae that curve backward along the sides of the body and three bristlelike appendages protruding from the last segment of their abdomen. The common firebrat (Thermobia domestica) prefers hot and humid environments, such as boiler rooms or behind an oven. Unlike most silverfish, the common firebrat is mottled in appearance with dark patches on its grayish-tan body. The house centipede only superficially resembles the silverfish, but there is a resemblance nonetheless. House centipedes (Scutigera coleopterata) grow two to four times bigger than the silverfish. They also have 15 pairs of legs, or 24 more legs than the smaller silverfish. Their bodies are grayish, sometimes with a yellow tint, and their legs are banded with light and dark stripes. Similarities between the two include grayish body color, they both move quickly and both prefer dark areas. Both are also common home invaders and may cause quite a shock when they quickly dart away from light. Terrestrial isopods go by many common -- and sometimes affectionate or funny -- names; armybugs and roly-polies are two of the more common ones. 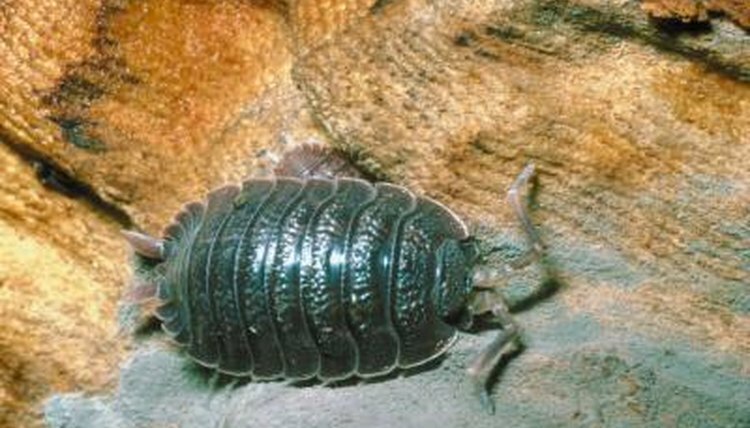 Pillbugs and sowbugs are commonly encountered isopods and aren't insects or even centipedes -- they're terrestrial crustaceans. Their resemblance to silverfish is primarily their color and outdoor habitat: Roly-polies are silvery gray in color and prefer moist, dark habitats. They'll occasionally wander indoors into damp basements and crawlspaces, but in general will die quickly in other areas of the home due to dry conditions. Another group of creatures that share body color and habitat preferences with the silverfish are millipedes. Again, any physical resemblance is superficial at best -- millipedes are long, tubular creatures with two pairs of legs per body segment. Like silverfish and isopods, millipedes require humidity and moisture to live and will quickly succumb to dry areas. Millipedes, like pillbugs and sowbugs, rarely enter homes. On the rare occasion they do, they often succumb to the dry conditions inside and die. What Do Centipedes Do During the Winter?